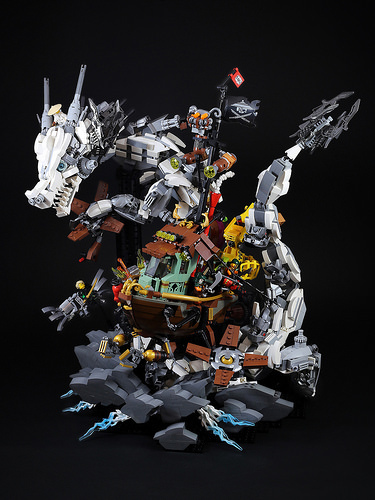 Taiwanese builder LEGO 7 is at it again with another incredible dynamic build. This time, a White Dragon Mech is ripping off the starboard propeller of the Sky Pirates’ flying ship. Lightning ripples out from the dark thundery clouds as the pirates scramble on deck. I love the colors and design of the boat, and the gold railing trim looks great. Have you noticed Monkey Wrench throwing a spanner in the works from atop the crow’s nest? Will Lloyd continue to evade the dragon’s clutches and save the day? Or will the flying clipper plummet earthward and suffer the dreadful fate of rapid deceleration syndrome? I think Lah-Lloyd is fighting alongside the dragon, working to bring down the Sky Pirates, no?